In the academic sphere, makerspaces are places where students can conduct research, work on projects and classwork, and share and curate ideas. Many large universities have already created effective makerspaces in their student libraries, and according to an article published by Open Education Database (OED), this trend is set to expand. “The idea of a communal creative space has only gained momentum and become increasingly popular over the years, and the maker’s movement shows no signs of slowing down,” the article reported. At Cornell University, students can 3D print just about anything in 112 Mann Library’s mannUfactory makerspace – they also have full access to the Digital CoLab in Olin Library 701, which promotes digital approaches to research. From laser cutters to computer numerical control (CNC) machines to, of course, 3D printers, many makerspaces boast a wealth of technology available for student use. Duke University’s Co-Lab Studios feature all of these technologies and more, as the university recently built two additional makerspaces on campus due to increased demand from students. As the primary function of makerspaces is to foster innovation, makerspaces hold various uses across university library systems and, according to an article published by Venture Well, are multifaceted in nature. “No two makerspaces look the same, and they can be adapted to each university’s space limits, budgets and imagination,” the article stated. The Alley at The Massachusetts Institute of Technology (MIT) is a bowling alley-turned-makerspace that supports both artful and technological innovation. The Alley carries equipment designed for sewing, crafting, woodworking, 3D printing, electronics and more, and hosts events on everything from designing personal websites to making decorative throw pillows. 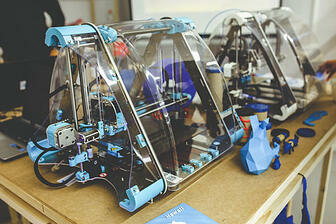 Due to the many functions of makerspaces, some universities have designated labs for specific innovations. For example, Brown University is equipped with multiple makerspaces for students: an audio/video lab, a design studio, multimedia labs, a digital studio and even a humanities-centered robotics initiative lab. As a whole, university makerspaces are working to advance universities across the nation by broadening resources and providing fresh, creative spaces that foster student research and growth. Planning for Higher Education, a publication for the Society for College and University Planning (SCUP), described the culture of makerspaces as a whole in a recent article. In addition to providing students with abundance of technological resources, makerspaces offer the perfect backdrop for students looking to conduct market research. Whether exploring a new idea or researching the competitive landscape within an existing industry, students conducting market research of all kinds can benefit from makerspaces, as they offer an informal learning environment designed for collaboration and creative innovation. To learn how students at your university can access BCC Research, visit our academic membership page.